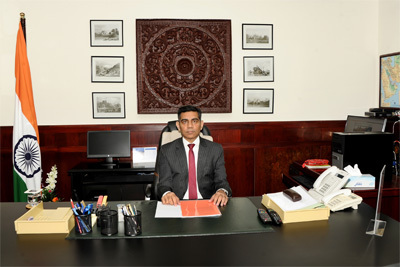 Shri Munu Mahawar assumed charge of the Post of Ambassador of India to the Sultanate of Oman on 21 August 2018. He joined the Indian Foreign Service in 1996. He has served in diplomatic Missions in Moscow (1998-2001 & 2008-2011) and Geneva (2005-2008). At Headquarters, he has served as Desk Officer for Nepal (2001-2005) and Director in Prime Minister’s Office (2011-2014). He also headed the Establishment Division (2014-2015) and UN Political Division (April 2015-September 2015) in Ministry of External Affairs. Prior to his present assignment, he was head of Americas Division from October 2015 to August 2018. Shri Mahawar was born in Dhamtari, Chattisgarh. He did his B.Tech in Electrical Engineering from IIT, Delhi. He speaks Hindi, English and Russian languages. His wife is also an Indian Foreign Service Officer. They have one son and one daughter.